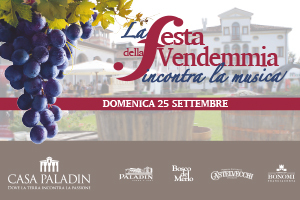 On Sunday 25th September harvest meets art, music and culture at Paladin winery. The Harvest is a collective rite from the archaic charm that is repeated every year in the first weeks of September. A ritual that becomes a big party open to visitors with live music, shows and, of course, wine tasting. Our wines will be matched with the notes of the association named “Musicaecultura” in Annone Veneto, that will delight your with performances and workshops for children. From 11.00 “the kids harvest” and at 16.30 treading in vats. At 18.00 final concert with piano in the beautiful natural setting of Casa Paladin. Throughout the day, wine tastings and guided tours to the cellar with our winemaker and enologists. The harvest party at Casa Paladin is an experience to live. Open from 10.00 am to 6.30pm. Information and booking: Tel. 0422 768167. Visit us at Prowein 2019 in Düsseldorf!